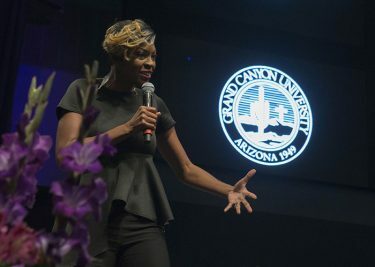 Jade Simmons, keynote speaker and pianist at Grand Canyon University’s fall commencement encouraged over 550 graduating students to take a few steps backwards to find their initial purpose. “When I look at people in their cap and gowns I do not see merely degree holders. I see world changers,” Simmons said. “Now, I do not say future world changers because I believe that from the moment you were born you began a journey of impacting our world but yet the tragic thing is that most people will live and die only knowing their natural role on this earth." 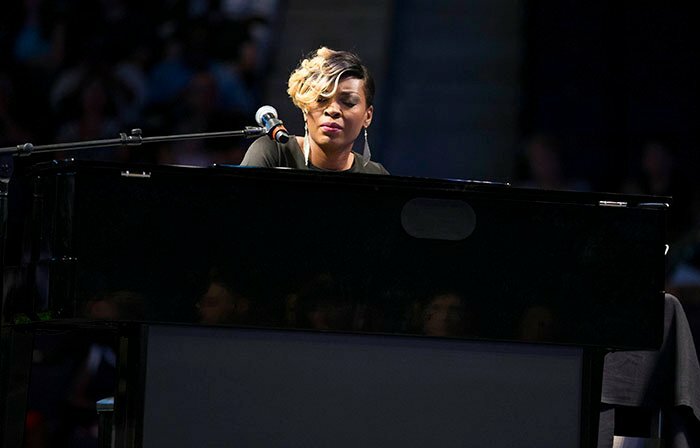 Jade Simmons included several piano performances into her keynote speech at GCU commencement. The keynote speaker at Grand Canyon University’s fall commencement told the graduates to start the next chapter of their lives by looking for their initial purpose. Jade Simmons, a pianist and self-proclaimed “purpose-pusher,” wants students to believe that everyone has a “supernatural purpose” that goes beyond individual professions, careers and degrees. We all have a “supernatural purpose,” Simmons said, and we sometimes need to take a step backward to find it. A reference point for the graduates is how Simmons, who mixes inspirational messages with piano performances, came to be called classical music’s “No. 1 maverick.” She described how she found her “superpower” when she chose to expand the boundaries of classical music by incorporating verbal messages into what she does on stage. This happened after a time in college when she discovered how much competition there was among classical musicians; instead, she drew on her musical skills to create a career as a performer. “I went on default mode and started creating what I called ‘samurai recitals.’ And, like all over-achievers, I was playing the biggest and fastest pieces and was trying to be ‘extra-classical’ … but that was tiring. I was competing myself to death,” she said. It all stems from her belief that too many people are simply told what to do and aren’t given a choice. Simmons urged the graduates to take a step back to get to know themselves and find what makes them unique. Then she sat down to play her piano along to the rhythm of African drumming — that sweet sound from her childhood. Simmons also is not embarrassed to talk about where she finds her inspiration. Simmons lives in Houston with her high school sweetheart-turned-husband, Jahrell Simmons, and their two children Jayden, 8, and Jasielle, 3.